President Barack Obama on Sunday marked the 15th anniversary of the Sept. 11 attacks by calling on Americans to embrace the nation’s character as a people drawn from every corner of the world, from every religion and from every background. He said extremist groups will never be able to defeat the United States. Obama spoke to hundreds of service members, and relatives and survivors of the attack that occurred at the Pentagon when American Airlines Flight 77 slammed into the Defense Department’s headquarters, killing 184 people. The youngest victim was only 3 years old. In all, about 3,000 people lost their lives that day as a result of the planes that crashed into New York City’s World Trade Center and in a Pennsylvania field. The president said extremist organizations such as the Islamic State group and al-Qaida know they can never drive down the U.S., so they focus on trying to instill fear in hopes of getting Americans to change how they live. Obama spoke on warm, mostly sunny morning, noting that the threat that became so evident on Sept. 11 has evolved greatly over the past 15 years. Terrorists, he said, often attempt strikes on a smaller, but still deadly scale. He specifically cited attacks in Boston, San Bernardino and Orlando as examples. 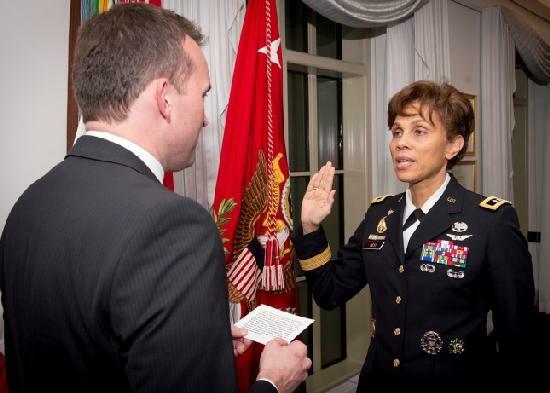 Falls Church, VA – The Senate confirmed Thursday Lt. Gen. Nadja Y. West to serve as the new Army Surgeon General and Commanding General, U.S. Army Medical Command (MEDCOM). This makes West the Army’s first black Surgeon General. Additionally, with the appointment as the 44th Army Surgeon General, West picks up a third star to become the Army’s first black female to hold the rank of lieutenant general. West was sworn in as the Army Surgeon general on Friday by Acting Secretary of the Army Eric Fanning. She most recently served as the Joint Staff Surgeon at the Pentagon. The Army Surgeon General provides advice and assistance to the Secretary of the Army and Army Chief of Staff on all health care matters pertaining to the U.S. Army and its military health care system. West will be responsible for development, policy direction, organization and overall management of an integrated Army-wide health service system and is the medical material developer for the Army. These duties include formulating policy regulations on health service support, health hazard assessment and the establishment of health standards. Dual-hatted as the MEDCOM commanding general, West oversees more than 48 medical treatment facilities providing care to nearly 4 million active duty members of all services, retirees and their Family members. MEDCOM is composed of three regional health commands, the Medical Research and Materiel Command, and Army Medical Department Center & School. West holds a Bachelor of Science in Engineering from the United States Military Academy at West Point and a Doctorate of Medicine from George Washington University School of Medicine. She has held previous assignments as Commanding General, Europe Regional Medical Command; Commander of Womack Army Medical Center, Fort Bragg, N.C.; and Division Surgeon, 1st Armored Division, Army Europe and Seventh Army, Germany. West hails from the District of Columbia, and she finished high school at the Academy of the Holy Names in Silver Spring, Md. While West’s promotion to lieutenant general is already effective, she will “pin” on the rank in a formal ceremony in early 2015. WASHINGTON — A day after committing the nation to a new mission against Islamist terrorism, President Barack Obama honored the victims of the Sept. 11, 2001, attacks, 13 years after four hijacked planes plunged the United States into a decade of war against distant enemies. For Mr. Obama, the Sept. 11 anniversary lent historic and emotional resonance to his announcement Wednesday night of a new mission against the Islamic State in Iraq and Syria. But it also carries a somewhat dissonant message: The president has labored to distinguish the expanded fight against ISIS from the wars in Iraq and Afghanistan. The president on Thursday made no mention of ISIS, speaking only of challenges facing the country. But his description of a nation coping with the threat of terrorism seemed entirely relevant to what is happening now. “We carry on because as Americans, we don’t give in to fear — ever,” he said. In some ways, this anniversary was no different than its 12 predecessors. It was filled with familiar rituals – a moment of silence, the playing of taps by an Army bugler, the assembled families of the victims, many now with children who have grown into adulthood. Earlier on Thursday, Mr. Obama and the first lady, Michelle Obama, along with Vice President Joseph R. Biden Jr. and his wife, Jill, took part in a solemn ceremony on the South Lawn of the White House at 8:46 a.m., when the first plane struck the World Trade Center. Later in the day, as they do every year, Mr. and Mrs. Obama will take part in a volunteer project. The president will otherwise remain at the White House, having lunch with Mr. Biden and meeting in the afternoon with his new secretary of Health and Human Services, Sylvia Mathews Burwell. But Mr. Obama is also certain to be immersed in the details of the military campaign against ISIS that he outlined Wednesday night in his speech to the nation. His warning about the challenges to come still hung in the air, even as he marked the anniversary of battles past. Americans born after Sept. 11, 2001, are now teenagers, Mr. Obama noted, and he said this post-9/11 generation gave him hope that the United States would remain resilient in the face of terrorist threats. WASHINGTON — President Barack Obama says the U.S. is safer and its people resilient on the 11th anniversary of the 9/11 terrorist attacks. Obama and First Lady Michelle Obama laid a wreath at the Pentagon, one of several official observances marking the suicide hijackings that killed nearly 3,000 people on Sept. 11, 2001. Aided by a Marine honor guard, Obama placed a white floral wreath on a metal stand above a concrete slab that said “Sept. 11, 2001 – 9:37 am.” A moment of silence began at precisely 9:37 a.m. In remarks at the Pentagon, Obama recalled a day “when grief crashed over us like an awful wave.” Later Tuesday, the president was to visit wounded soldiers and their families at Walter Reed National Military Medical Center.